Well, in that case, allow me to answer. It is legal to shoot hens within the overall bag limit. Some people choose not to shoot them while others choose to shoot them. Honestly? It was the 2nd bird of a double that I thought was a drake. I don't intentionally shoot hens. I had a group of about 25 work. The closest was a drake I could tell clear and easy because he practically landed on the end of my boat. The next closest bird that I thought was a drake, was on its way up and I was looking right into the sun. Both were very clean and effective kills which I think is always a positive thing. I don't kill hens intentionally so when I do error its never more than one bird. On future hunts I'm very willing and able to pass on single hens etc. I try to do better next time. Simple as that. Yeah i got mine outa the middle zone too.... but that was opening weekend. 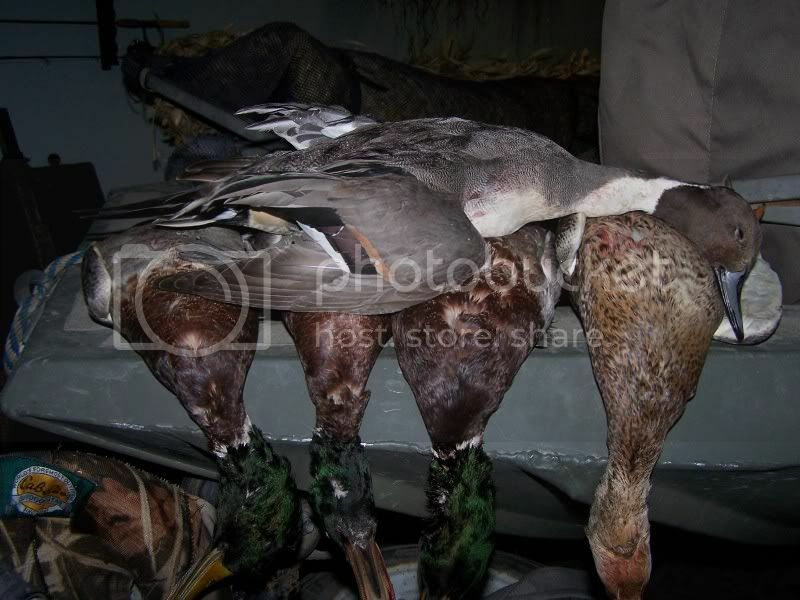 Only 3 teal since then. This was my first sea duck hunter ever (and first hunt of the season i came home with game in the bag) . What an experience, if you have any hope of not becoming completely addicted to waterfowl hunting and haven't gone Sea duck hunting, this is your warning... DON'T DO IT!!! Got my first duck double and triple ever, just another added bonus. In Texas we have the Hunter's Choice and can shoot (1) Canvaback. Kafasi, what state are you in? Just curious. We had a good morning. 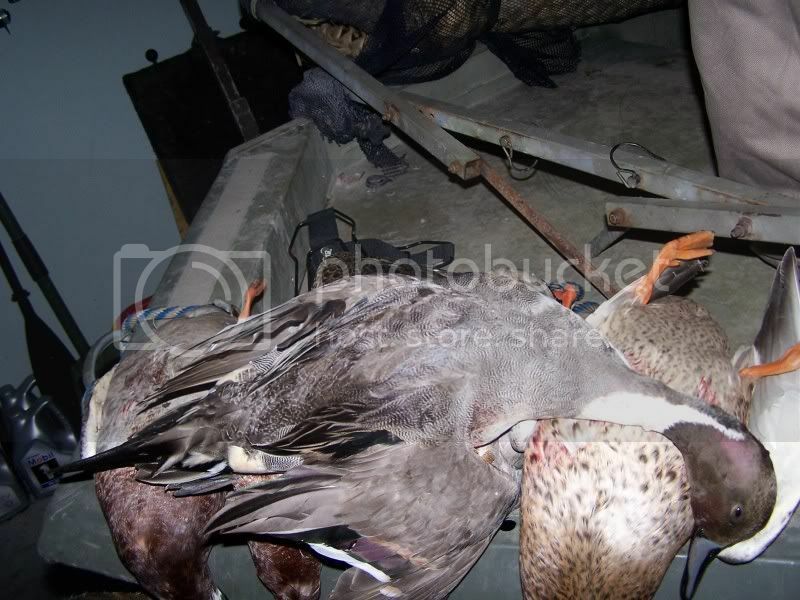 I shot a limit and my partner got three. One of the gadwall drakes was a beautiful specimen and I probably should have saved him to mount. And, yes, we shoot hens. Someone on here wanted to see a better picture of my decoy bags. I bought the camo cordura online and had an auto upholstery guy make them to my specs. Should have given them a bit more height on the inside, but they do well enough as they are. Bungee is strung through the top and we put brass eyelets on the bottoms to make them drain. They are held on with SS screws and can be removed for annual cleanings. Probably should have mounted this pintail. Finally got one with a nice sprig. it's been a bit slow around here lately. 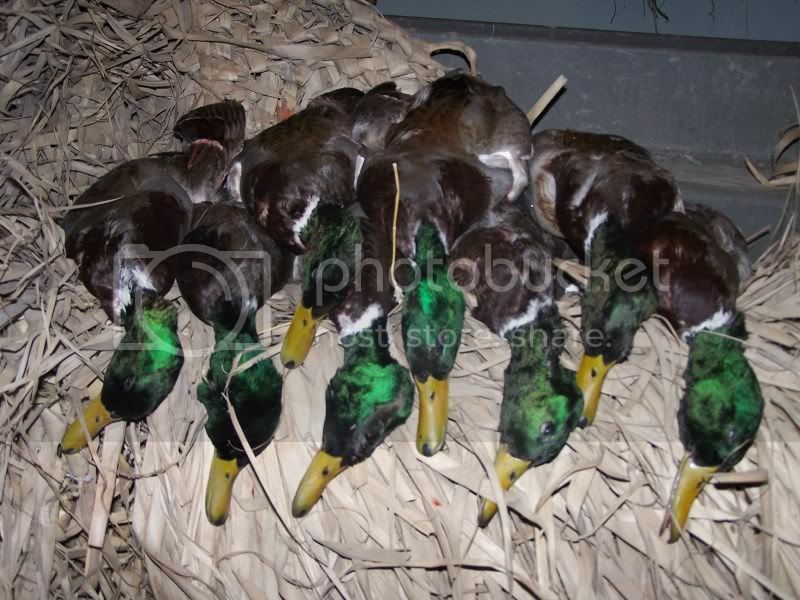 Yesterday's outing produced 2 woodies, 2 ringnecks, and my old buddy Leroy whacked this banded greenhead. 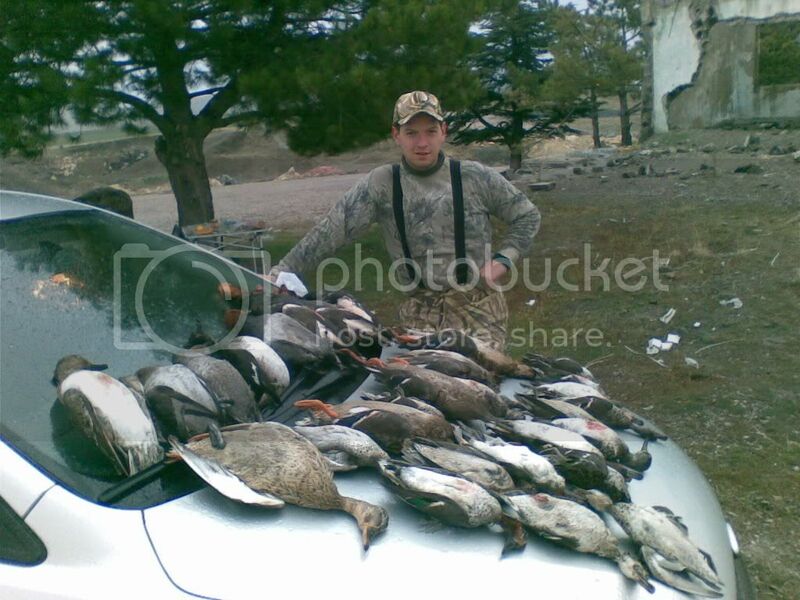 Tucker, if your still duck hunting consider yourself lucky. We froze in like Antarctica starting the week of Thanksgiving, and there is no looking back. At 6AM today morning temp was -6 F.
We'll keep at it for the rest of the season, and goose through Feb.
We haven't seen a complete lockup around here since about 1976. You just keep right at it till the end like we did. Honestly it hasnt been this cold with so much snow since about 1976 here either, this is just rediculous. Should be driving trucks out on Green Bay soon, frozen ice several feet thick. I was going to add some pics but not sure how. I clicked on manage attatchments and their was no icon for uploading. Any advice? That whole attachments thing is there just to frustrate new users. You need to use a hosting service like Photobucket. Once you've got the pics uploaded to Photobucket, simply copy and paste their Image Code to your post. Easy as falling off a three gun station and scuffing your knee pads. Here is a step-by-step I wrote some time ago. it doesn't mention the copying and pasting the IMG code, but you'll get the gist of it. Either method is fine. Thanks Tucker I will try it out tomorrow after deer hunting. We have a two day bonus gun season this weekend.